Halabcha repeated as Champions in Iraqi women basketball league 2018. They posted a 63-59 win over Acad. In the game for the third place Al-khtot Al-Jawiya overcame Alsinaat Alkahrabaiya 60-49. Earlier Halabcha overcame Alsinaat Alkahrabaiya 63-61 in the semifinal clash. Acad meanwhile edged Al-khtot Al-Jawiya 41-20 in another game. Halabcha won Iraqi women basketball league 2017 with 7 participating teams. Halabcha won Group B with a 3-0 record beating Darbandakhan 41-10, As-Slaikh 80-40 and then Aphrodite 77-23. In the Semifinal game they beat Zima 60-13, while Sennharib outscored As-Slaikh 71-44. In the Final game Halabcha edged Sennharib 55-48. 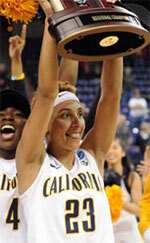 Lousada AC (Liga Feminina) agreed terms with 24-year old American guard Brittany Shine (178-92, college: California). She played last season at Serwan New Club in Iraqi Superleague. Shine played in the final of Pac-12 Tournament in 2015. She graduated from University of California in 2015 and it will be her second season as a professional player.